Castle Green Gardens - Spring 1957. 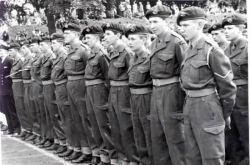 HCS CCF contingent standing at ease awaiting the arrival of Princess Alexandra." R to L 1. Michael J. Read (2nd row); 2. William Tucker (3rd row); 3. Peter Fairman-Bourn; 4. T. A. Foxton?? ; 5. Ian M. Jones; 6. ?? ; 7 ?? (2nd row slightly hidden); 8. R. D. Thomas ? ; 9. J. K. Bartlett; 10. ?? ; 11. ?? ; 12. ?? with stick & sash; 13. with stick?? ; 14. with stick probably CSM ?? If you can identify any additional names please contact the OH Club Development Office.